Lupus is a chronic, autoimmune disease that can damage any part of the body (skin, joints or organs). Over 1.5 million Americans have Lupus, most develop the disease between the ages of 15-44. The Lupus Foundation had been sending out inspirational messages of hope to those suffering from the disease. But, we wondered whether in an effort to inspire hope and engagement, was the disease’s devastation being ignored? So little was known or understood about this pernicious disease that we knew we had to brand the disease. To educate the world that Lupus is hidden, unpredictable, undefined, and misunderstood, hits out of nowhere, ravages different parts of the body, can range from a skin rash to a heart attack… is cruelly chronic… and debilitating and destructive and can be fatal… with no known cause and no known cure… we identified Lupus as a cruel mystery. And we reached out to America and asked them to help us Solve the cruel mystery. 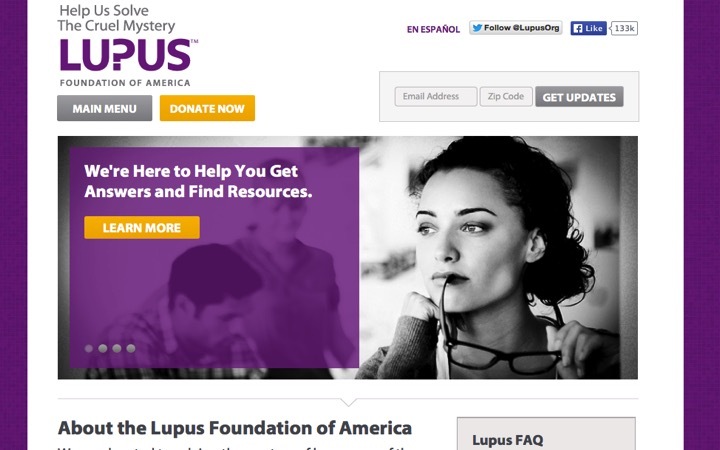 “Lupus –The Cruel Mystery” has broken through and helped America learn about this misunderstood disease. The Foundation built a bus and took it on a “Cruel Mystery Tour” across the country educating people about the condition and how they can help. Attendance at events are up. Donations are up almost 20%! And the new branding has been warmly embraced by the entire organization.